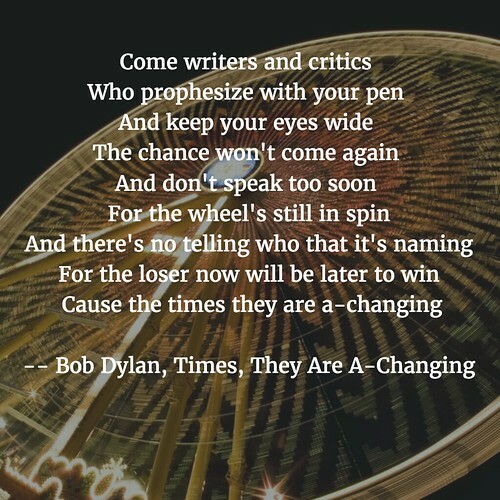 A few weeks ago, my friend Laura put out a call for a project that she was doing that would feature the Bob Dylan song The Times Are a-Changing. When I first taught myself guitar, that was one of the songs I wanted to learn, and did. Laura was hoping to build a musical quilt of songs and voices and words, as part of a public performance. I grabbed my guitar, re-learned the song a bit, and then choose the verse that I think has the most resonance for the times that we are in right now – the one where Dylan calls out politicians and writers to embrace change for a better world and be ready to defend the choices you make in the moments before you. I recorded the verse and sent it forth to Laura, to use as she saw fit. A few weeks later, Laura shared out a video of the live performance of her Affirmation Quilt. As I watched and listened via YouTube, I was pleased to hear her cello layered in on top of my guitar and voice. She is a talented musician, and I was honored to hear her strings on top of my ragged singing voice. It was wonderful, particularly as she wove the music in with spoken words contributors by others, and other music pieces, too. She also performed the song, live. That was the quilt affect she was going after. But this story doesn’t stop there. Ron, another musician friend from another part of the world, watched Laura’s video, too, and he asked if she could share it on Soundcloud. He wanted a copy of the song. I figured he was up to something, and of course, he was. Ron, a talented keyboardist, took the duet of Laura and I, and made it into a trio (or more) by adding keyboards and other elements in Garageband, and then shared it back out again. None of us (including Dylan, as far as I know) have ever met in person to jam. We only know each other through our networks, coming together for a shared purpose with shared interests. When collaboration comes together like that, it’s magical and powerful. Thank you, Laura. Thank you, Ron. Thanks to Maha for sharing this video out long ago (got lost in my draft bin), as a companion piece to my blog post the other month about gender and gaming. Nothing like some collaborative energy to celebrate a friend, and that’s what Maha, Simon and Susan and I have been up behind the scenes for our friend, Terry, whose birthday is today. We recorded a song, and then some thoughts — all via on online collaborative audio tool called Soundtrap (I’ll share out more about it later). For now … Hey Terry, It’s Your Birthday! And here is a bonus that I made for him, too. A comic series about our journey into the rabbit holes of technology. Before you read this, read this. Are you back? Did you read it? Man, I love when people like Terry do that … pulling back the curtain on digital composing. As I was reading his piece it occurred to me … we work differently. I was reading as he talked about the lists he makes, the lines he draws out, the resources he has at his finger tips, the thoughtfulness that goes into what he composes (in this case, with Zeega). He’s got a system. He leads with the brain, and reaches for the heart. I start at the heart, and aim for the brain. What I mean is that when I do what Terry explains he is doing (honoring someone’s blog post by remixing it with digital media via Zeega), I dive in and let the muse take me to where it will in a person’s piece. 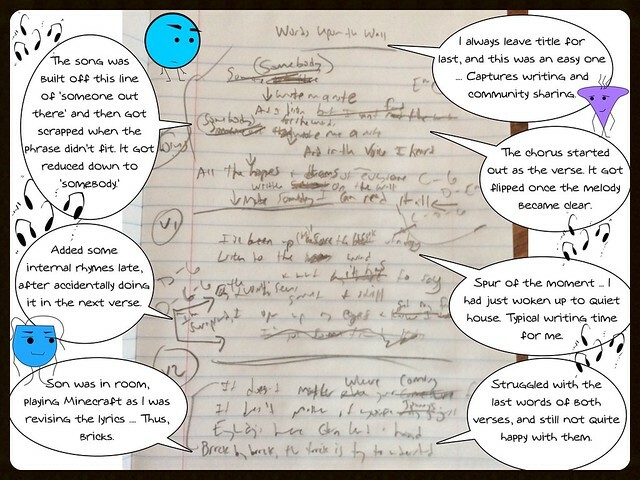 I’m searching for anchor phrases and trying to find the center of the blog post. I hate to admit it — but I don’t think too much about it. I trust my instincts to find where it is I need to go. Mostly, it works. I think. And Terry’s process? Oh yeah, it works, too. Both of our methods work, and there are probably a myriad of others out there (what’s yours?) but mostly, they seem a mystery to your audience. Doing as Terry has done — showing what he is thinking about as he composes and the tools he is using to compose what he is thinking about — is a valuable analysis, providing insights to the writer. 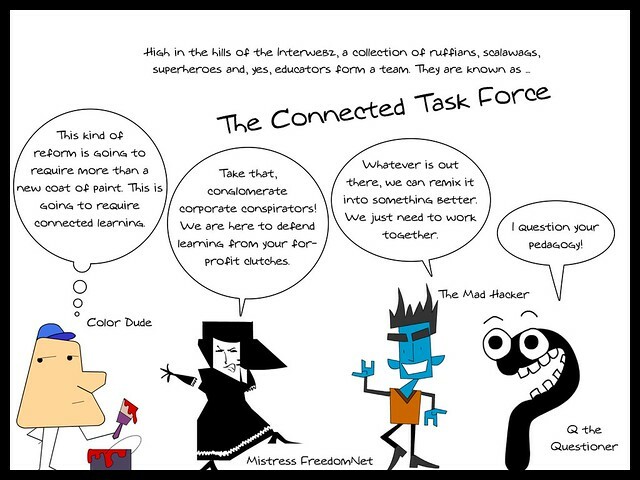 Here’s a Zeega I did this week in honor of Jim Groom’s fantastic piece about connected learning called Connected by Design. My composing process? Picked phrases and sentences that resonated with me. Interested that he had also chosen some phrases and ideas from others, using those as anchors in his text. So I am anchoring my anchors in his anchors. Recursive anchors? Considered fonts. Spent more time in fonts than anything else. Not sure why. Seemed important. How does shape of letters inform our composition? Not satisfied with fonts but gave up on it after a time. Used the Zeega search engine to find animated gifs as background (struggled here for a stretch … what’s too busy? what’s evocative? what pushes up against the words?) Thought, what about still images? Fell back to animated images. Seems more Zeega-like. Did a search for “connected” on Soundcloud. Replaced one track with another when I noticed the Stereo MCs in the mix. Like the shuffling hiphoppiness of the track. Connects to the freeflowing ideas of Jim’s post (in my mind, anyway). 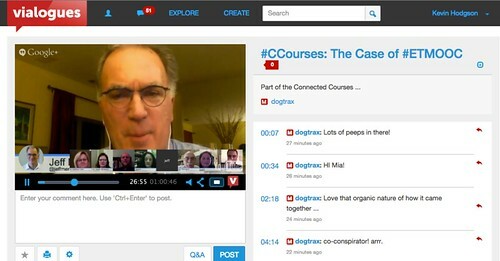 Published Zeega and posted and shared with Connected Courses. 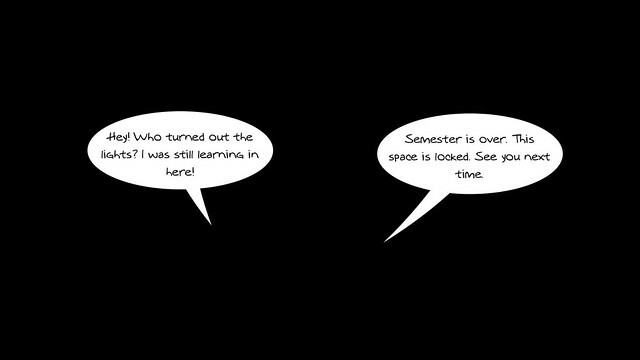 Come join me in reflections about a video discussion about the lasting impact of ETMOOC, via Connected Courses. 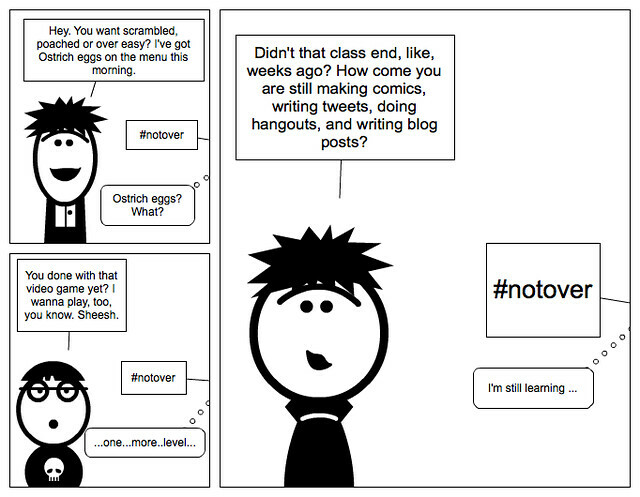 I wasn’t part of ETMOOC, although I think I signed up for it. I followed it from a distance, and yet, it reverberates through many networks that I am in. 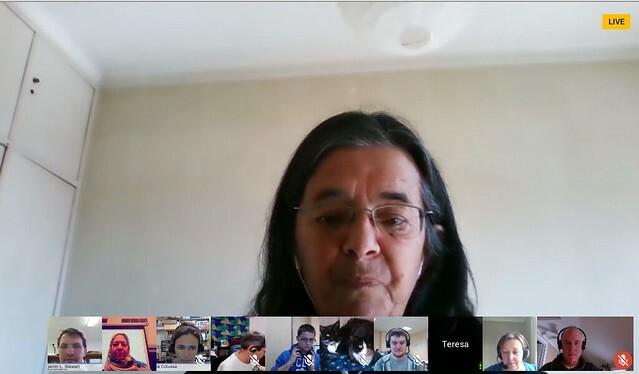 I’ve put the hangout – with Alec Couros, Mia Zamora, Howard Rheingold and others — into Vialogues.